Many elements determine the optimum output in a PV module, one of which is the concept of soiling. Soiling occurs as a result of dirt, dust and other particles covering the surface of the PV panels. Dust composition widely varies across the globe, which affects both the type and amount of soiling. There are a number of methods to quantify soiling including conventional pairing PV reference cells and smarter methods such as advanced data analysis. 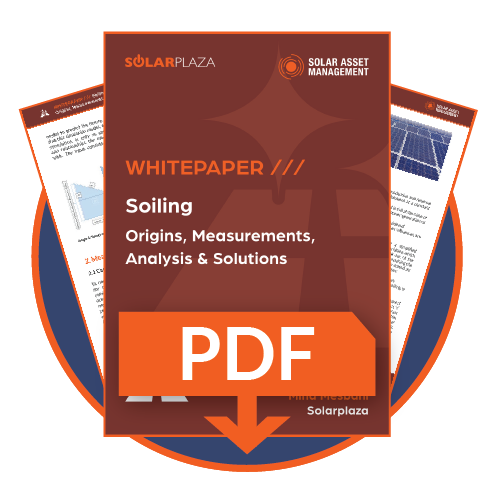 It is imperative to measure soiling for operational PV plants as well as pre-construction site surveys, since soiling can anticipate future performance. To eliminate the effects of soiling, the panels require cleaning, which can be carried out utilising either wet or dry solutions. There is a wealth of cleaning methods available, subdivided amongst the three main categories of manual, mechanised manual and robotic cleaning (the last one being subcategorised into automated or semi-automated). Although soiling cannot be prevented, its negative effects can be mitigated by dint of deploying dust-repellent agents and instruments.